there are muthafuckin ants on the muthafuckin airport ceiling!!! 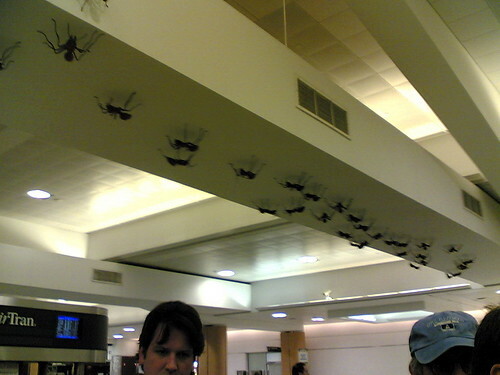 Are the "muthafuckin ants on the muthafuckin airport ceiling" rally that huge??!! They look gigantic in your pic!! O_O btw, there are SICKENING flies in big shopping malls too. They will fly around you (and your food) when you are eating... SICK!! muthafucka! why are they muthafucka humans in the muthafucka airport?! Spinnee: Dunno.... somehow when I saw the ants, I thought of KingMeng's muthafucking snakes. Super bian tai. Like that very nice meh? Spiders nicer I think... Hahahha... Freaky! Jaslyn: Art is a form of expression of the individual and subject to interpretation. Personally, I thought it looked fine. Spiders would have been over-the-board and unless, the theme is in line with the coming Halloween, I think I prefer the more modest working ants. That's some mutherfucking ants, dude. Mutherfucking AWESOME!!! Snakes on a Plane 2: Ants on a Ceiling. King Meng: As long as not Ants In Your Pants, can liao.